New legislation has been proposed to offer free wheelchairs to people in Scotland with short-term mobility problems or injuries. The NHS does not currently have to offer a wheelchair to anyone expected to need one for less than six months. Scottish Labour MSP Jackie Baillie has drawn up a member's bill to make it a formal duty for public bodies to do so. She said it was a "relatively small change" which could make a "significant difference to people's lives". 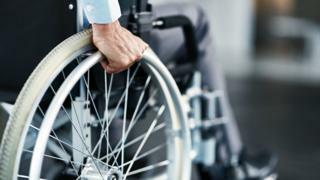 The Scottish government said it was planning on "developing guidance on the short-term loan of wheelchairs", and would "look forward to seeing the responses from the consultation on this draft member's bill". The current criteria to access NHS wheelchair services states that the need for one must be permanent. A freedom of information request by Ms Baillie found that only one NHS wheelchair provider in Scotland was prepared to offer one on a short-term basis, and only in specific circumstances. The Dumbarton MSP said that, as a result, the provision of wheelchairs was varied, inconsistent and often dependent on an individual patient's own knowledge of the system. She said: "Not being able to access a wheelchair when you have a clear short-term mobility need can lead to a delay in discharge from hospital, prolong your rehabilitation, slow down your re-ablement and have a negative impact on your emotional well-being, your social connections and your financial situation." Ms Baillie's draft bill has gone out for consultation, and will proceed at Holyrood if she is successful in winning backing from enough fellow MSPs. Fiona MacLeod, of the British Red Cross, backed the move, saying: "Through our services, we see every day the significant difference that accessing a wheelchair can have. "Not only can it help people get out and about and maintain some sense of their life but it can help them to get to work, reduce their dependency on their family and friends, and sometimes speed up their recovery time." A Scottish government spokesman said: "We will soon be developing guidance on the short-term loan of wheelchairs as part of a wider review of the national guidance on equipment and adaptations, due to take place this year. "This follows an initial scoping exercise and pilot work with a health and social care partnership last year. "We welcome Ms Baillie's interest in this and look forward to seeing the responses from the consultation on this draft Member's Bill."